Hold your horses; rather, you don't even need to get on horses out in wine country somewhere to experience excellent wine education. It's available right in your backyard down in Newport Beach. 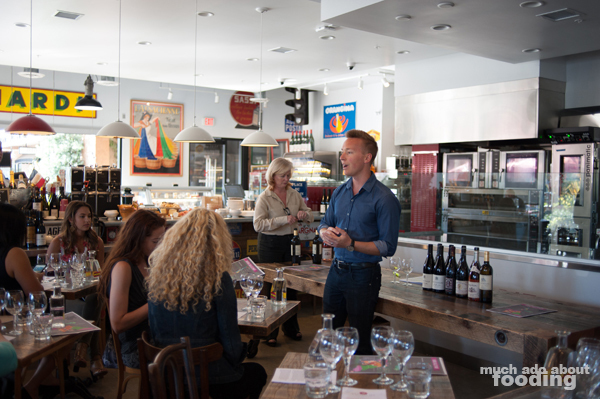 Moulin Bistro is hosting monthly, interactive wine education courses showcasing 6-8 boutique French wines of limited production. 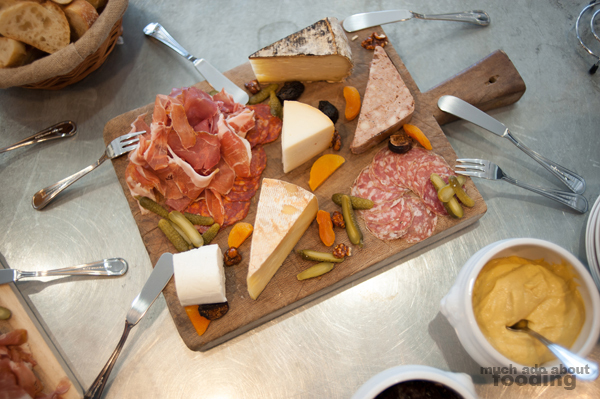 For only $29 per person, guests can learn about the featured region in France to better understand the identifiers for the area and the unique flavors that accompany each varietal as well as taste the wines to better understand the terroir profiles. We were invited to join for the Rhône Valley session in April and definitely came away with some notable notes to remember. 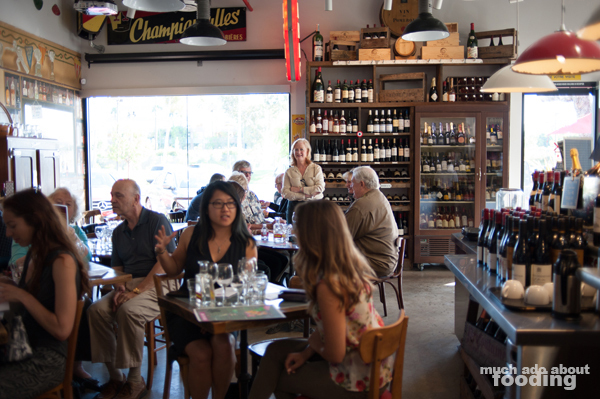 One Saturday every month this year from 5-7pm, experience a variety of wines from a specific region in France and learn a little bit about each area. 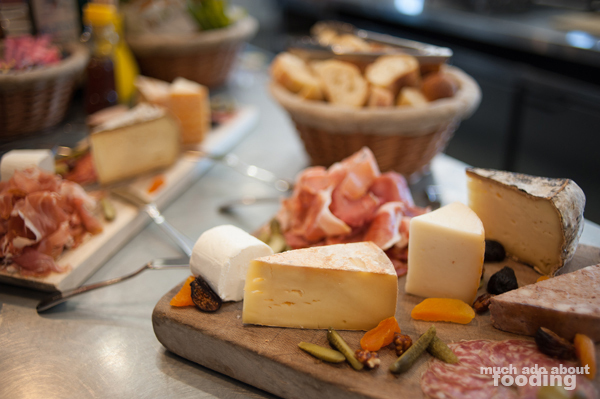 Alongside the wine tastings are carefully curated cheese and charcuterie boards with freshly baked bread from the bistro itself, and every learning session is rife with other wine enthusiasts as well. If you already know what way of French wines you lean or are curious about learning more about a certain region, the listing below shows what's lined up for the remainder of 2016! What we especially enjoyed about our first tasting at Moulin was the informative map we got of the Rhône Valley and the short biographies on each winery we were partaking from - it gave us a better sense of what we were drinking, where it derived, and why the terroir might be a certain way. We began our session in Costières de Nîmes, the most southerly appellation of Rhone, with the Mas des Bressades Viognier / Roussanne 2014 ($22) which was a beautiful, aromatic start to the course. Floral and structured, this wine made Duc and me more resolute that we really enjoy viogniers for when we want to veer toward whites. Our second pour was from Côtes du Rhône AOC through the Pink Pegau 2015 ($23), a rosé made of 70% Cinsault, 20% Grenache, 10% Clairette. The majority of this wine being Cinsault made for a heavier rosé that had a strong enough structure and body to hold up against heftier meals like a summer barbeque, uncommon for typical rosés. 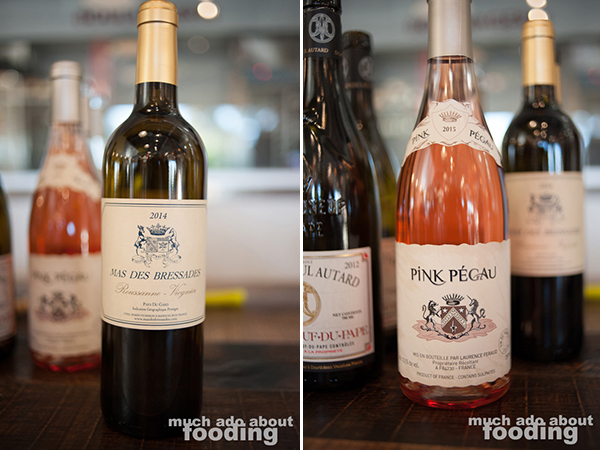 One of the great parts of these tastings at Moulin Bistro is that every wine we were able to taste could be purchased that same day from the restaurant/store itself. 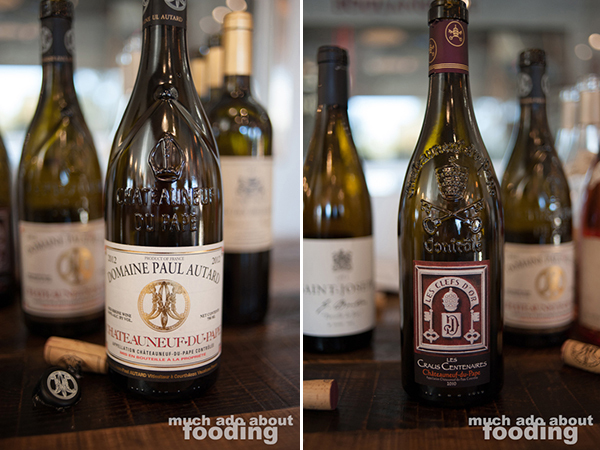 When we entered Châteauneuf-du-Pape AOC, the most well-known of southern Rhone appellations, in tasting, we found two wines that we really enjoyed - the Domaine Autard Châteauneuf-du-Pape 2012 ($49 - 70% Grenache, 15% Syrah, 15% Counoise) and the Domaine Jean Dyedier Clef d'O Les Craus Centenaires 2010 ($79 - 80% Grenache 20% Syrah). The area of France is unique in itself, being open to producing wines from up to 18 different varietals rather than a single red type. 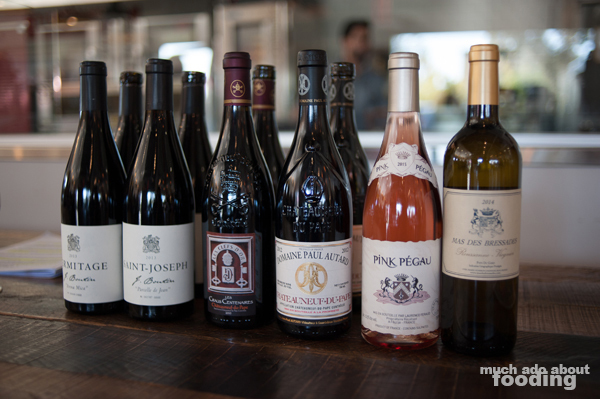 The majority there are composed predominantly of Grenache but the other varietals are able to build style for each bottle. We enjoyed the earthiness and peppery feel of the former which was complex without being too heavy, smoky without being overwhelming. While the former was made from vines that were between 45-90 years old, the latter of the two is produced on a very limited basis at only 650 cases per year if even produced that year. Vines from that winery date back to 1896 so we were certainly having hard-to-find wines; what a treat! Every guest there seemed to be enjoy him/herself as we all learned more about our sips. We moved into Saint-Joseph AOC next, on the west bank of the Rhone with its heart directly across the river from Tain l'Hermitage, with the J. Boutin Saint-Joseph "Parcelle de Jean" 2013 ($29 - 98% Syrah, 2% Rousanne). This rarity with only 5,500 bottles made was fruity and bright, all the more significant to keep note of as every bottle is numbered. 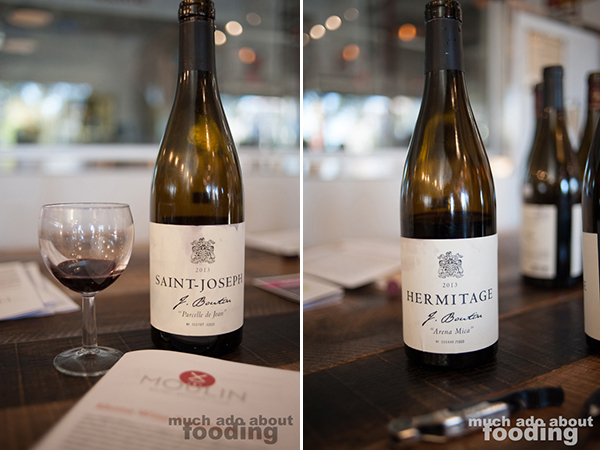 From Hermitage AOC, the south-facing slope overlooking village of Tain l'Hermitage on the north side of the river which was named from a legend, we enjoyed the J. Boutin Hermitage Rouge "Arena Mica" 2013 ($89 - 100% Syrah) picked from vines more than 40 years old and named after the winemaker's mother. The "Arena Mica" in the name referred to the soil in which the grapes were grown; that is composed of a mixture of limestone and iron-bearing clay soils covered with pudding stones and crystalline galets. At just 1,500 bottles made, this one was even rarer to partake of and we really enjoyed its structure and strong peppery weight that lacked the muskiness of a Châteauneuf-du-Pape. 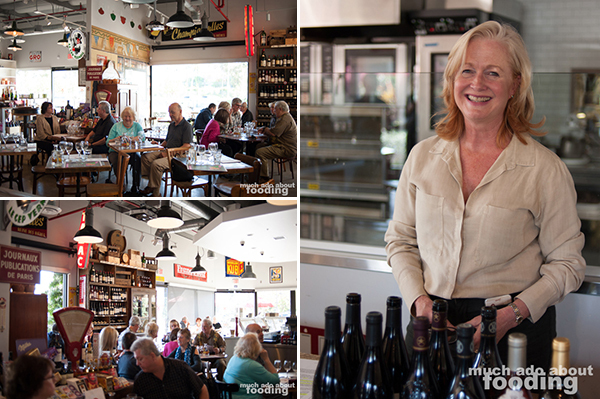 If you are interested in joining others at the next wine tasting, May's is this week! 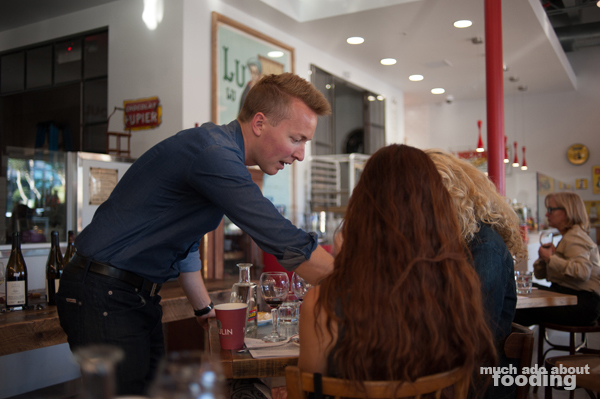 Find Moulin Bistro at 1000 Bristol St in Newport Beach, and make sure to reserve your seats. At just $29 per person, these courses are quite the steal. Let us know if you're going too - I believe we'll find ourselves at the June one because Duc is a fiend for the Loire Valley!